Spent the bulk of the week doing media outreach and interviews, taping Boulder-based climate and renewable energy experts, and shaking down the trike for the upcoming journey. Had earlier made a quick trip to Aspen with my buddy, Pete Shanta (thanks for all your help, Pete!) to interview other key experts, including Lester Brown, President of Earth Policy Institute; Jim Walker, former president of the American Wind Energy Association; and Harvey Wasserman, one of the nation’s leading nuclear energy experts. One afternoon, rode up the famously steep hill to the National Center for Atmospheric Research Center (NCAR) to interview Dr. Kevin Trenberth, one of the world’s leading climate experts. The hill was a nice dry run for the electric-assist motor, which did its job. Other local renewable and climate experts I interviewed included Mark Serreze, Director of the National Snow and Ice Date Center; Ron Lehr, Western Representative for the American Wind Energy Association; and Sandy Butterfield, former Chief Engineer of NREL’s Wind Technology Center. 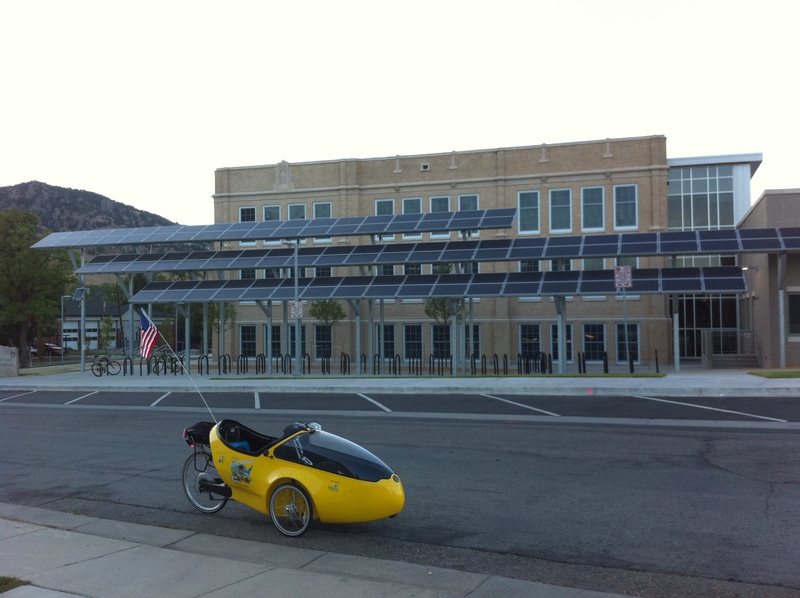 Stopped by the University of Colorado campus during the lunch hour one day to show off the trike and up walked Scott Wooley, president of the CU Energy Club (another group I had been hoping to connect with). He invited me to speak at the group’s inaugural meeting the following day, which I did. Very impressive turnout at the meeting (over 60 students) – proof positive that renewable energy is catching fire with college students alarmed about the state of the climate. The next day, ran into one of my ride sponsors, Dr. Stephen Perry, at a crosswalk in Boulder. The synchronicity just keeps flowing. Want to give a shout out to “Bear,” Ken and their co-workers at McGuckins (Boulder’s local hardware store) for going out of their way to modify some accessories on my trike. Really appreciate that, guys! Shop local. Also need to give a shout out to Tommy, James, Jason, Justin and Josh at Car Toys for tricking out my trike with a blinker system (powered by a flexible solar panel). Really appreciate that, guys! Thanks to Graham Hill for donating a solar-powered rear light for the trike, and a special thanks to Ellen Hall and ride sponsor Cat Eye for donating my solar-power headlights and other gadgets. Visited the Boulder Center for Sports Medicine for a check-up on my 48-year old knees and to get properly fitted for the “rocket trike” (thanks, Clint, for the recommendation) Andy Pruitt and his staff got a kick out of the trike and gave this middle-aged recreational bicyclist the kind of attention you might expect for a tour pro. Turns out, he’s spending a day working with Alberto Contador (winner of the Tour de France) in Spain next week. Nice to to be in the hands of the best in the business. Andy suggested I get an adjusted fitting at a bike shop partway through the ride, which I certainly plan to do. Rode by Casey Middle School to show off their impressive solar array. Rode by Boulder’s Unity Church for a conversation with Minister Jack Groverland. Monday night, finished packing up the bike, then joined a group of friends to celebrate Marti’s birthday. Fun last night in Boulder. Still working out the bugs on the website, but the panniers are loaded up, the battery’s charged, the flag’s flying and I’m ready to roll. Tomorrow I start pedaling east. This entry was posted in 2010 Ride, Articles, Blog, Video and tagged alberto contador, awea, boulder reporter, boulder weekly, cu energy club, lester brown, ncar, nsidc, ride for renewables, tour de france, unity church. Bookmark the permalink.